Pilsdon Pen is the highest hill fort in Dorset, England. Pilsdon has a long history of occupation. Flint tools over 10,000 years old and two Bronze Age burial mounds are evidence that the site was in use long before the hill fort was built. The hill is topped by an Iron Age multivallate Durotrigian hill fort which was excavated in the 1960s by Peter Gelling of the University of Birmingham with his wife Margaret Gelling at the request of Michael Pinney. 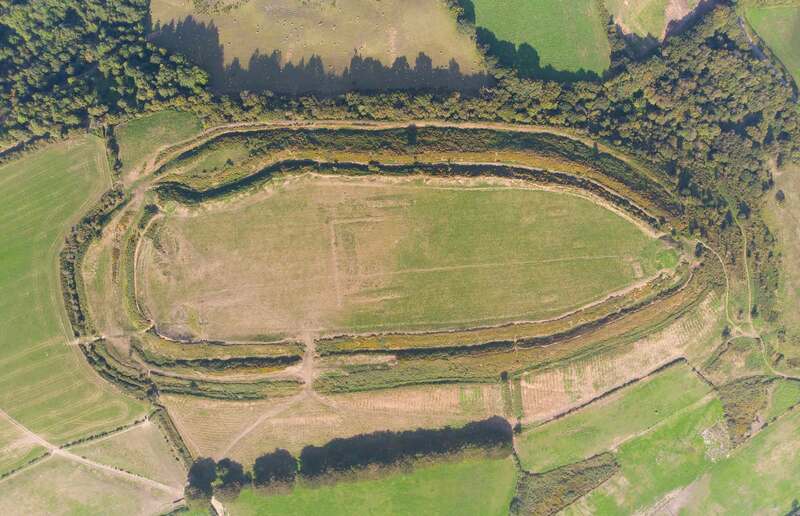 The remains of 14 roundhouses were uncovered near the centre of the hill fort. Surveys were also carried out by the National Trust in 1982 and by the Royal Commission on the Historical Monuments of England in 1995. This area was ruled by the Durotriges tribe who lived in what is now known as Dorset. But we’re just a few miles from the border with Devon which was ruled by a tribe known as the Dumnonia. Photographers notes: This site was really easy to find and only a short walk from the layby to the top of the fort. This is the second highest hill in Dorset and you can see for miles. The ditches and fort are huge, takes 15 mins to walk around. Flying was easy. Could probably use a low level circuit on video to show the ditches more clearly but I had only 2 batteries on the day. One of the best Hill Forts in Dorset – well worth a visit! Summary: Highest of Dorset hillforts at 277m O.D., multivallate, contour hillfort located the end of a spur overlooking W end of Marshwood Vale, 7km W of Beaminster; one of four hillforts in the area. Irregular shaped oval enclosing c. 3.2ha. Naturally steep surrounding slopes utilised on all but NW side where approach c. level. Defined by two massive banks and ditches with small counterscarp, where slope is less steep or interval between inner and outer ramparts. Inner rampart absent in places. Inner and outer ditches mutilated by hedge banks on NE and SW respectively. Near middle of fort square enclosure surrounded by slight bank c. 7.6m wide with traces of external ditch, now thought no older than 17th century; adjacent is possible long barrow. SW bank destroyed by pillow-mound. Four entrance gaps. That on SE has outer bank stopping short of gate to provide oblique entry and appears to be original; that on SW platform between the ramparts on its S flank possibly also. Of the two entrances on N end that on NW probably modern, but that on NE possibly original and masked by a convergence of the ramparts. Excavation by P.S. Gelling 1964-71 (Gelling 1977). Three areas investigated. First on NW remains of abortive ramparts never completed, with central entrance, double rampart and ditch 1.8m deep, possibly first attempt at construction. Small Roman sherd was found near gate. Second area to S where two typical Iron Age round huts excavated. Finds included domestic refuse, fragments of crucible to which were adhering minute specks of gold. Finally, and contentiously, in square area in centre of site (see above), Gelling interpreted a rectilinear timber structure, with two associated huts, one containing a Gallo-Belgic XV gold coin, as a temple in operation c. 80 BC to 40 BC, later replaced by low banks and a token demarcation of a temenos area. However, in a re-working of the excavation in 1982 by D.W.R. Thackray the temenos was considered a much later feature and possibly part of the medieval rabbit warren. Generally well-preserved, but on SW bank destroyed by pillow-mound and ditches mutilated in places. Owned and managed by National Trust. On 1st Ed. OS map (1889).